Is it time to consider trading in that old wood deck for a new low maintenance deck? Maryland is known for several things, including Natty Boh, Old Bay, delicious blue crabs, and cold, snow winters. And unless you are still a student, snow days are nothing but trouble. Gone are the days when snow meant snowmen, sledding, and, of course, no school. Gone are the nights when you would wear your pajamas inside out just for a little extra luck. Now you dread the snow. It means backbreaking labor: shoveling the sidewalk and driveway. It means long, hazardous commutes to work. And, if your wood deck is old enough, it could mean disaster. With regular maintenance, the average wood deck will last somewhere between 10 to 15 years. Without regular maintenance – staining, sealing, repairs, etc. – your deck may not last that long. Either way, when your deck is older, snow presents an immediate threat. According to a study performed and published by Morse Technologies Inc., USA., there is a correlation between deck failures, the age of the decks, and increased load (weight). Almost all of the 179 reported deck failures between January 2000 and December 2006 occurred while these decks were either occupied or under a heavy snow load. Furthermore, according to the International Association of Certified Home Inspectors, only 40% of existing decks are “completely safe.” So maybe it is time to consider replacing that old wood deck with a new Low Maintenance Deck. 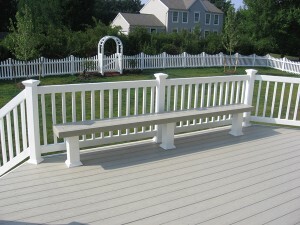 Mid-Atlantic Deck and Fence has been building custom fences and decks throughout Maryland since 1987. And while it all started with wood decking, we offer low maintenance deck options as well. Stop in today and we will help you design a deck that fits your home, and your budget. We use a 3D deck design software program to give you a better idea of how your new deck will look on your home. This is just one of the many reasons that Mid-Atlantic Deck and Fence Co. is one of Maryland’s leading and most innovative deck and fence companies. If you have any questions about Low Maintenance Deck Design in Maryland, please contact Mid Atlantic Deck & Fence (MAD Fence) today by clicking here or calling 1-800-833-9310. We proudly serve Anne Arundel, Baltimore, Howard, Montgomery and surrounding counties.